The bottom surface of mailbox shall be not less than 36″ and not exceeding 42″ from the ground surface. 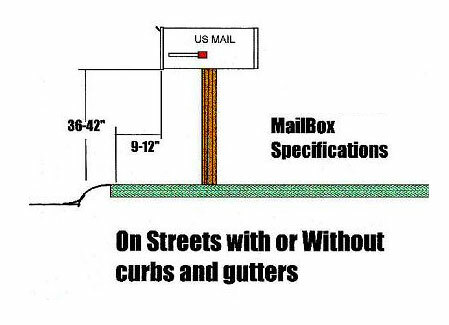 Mailboxes and supporting fixtures shall not be installed within 10 feet of the point of curvature at any street intersection. In the event of damage to a non-conforming mailbox installation due to City snow removal efforts, no compensation will be made and the property owner will be responsible for the repair or replacement of that mailbox installation. In the event there is damage to any mailbox which conforms to the standards above as a result of and caused by the snow removal activities conducted by the City, the City shall not be responsible for any cost of repair or replacement thereto in excess of twenty -five ($25.00) dollars. Any such reimbursement of cost to the owner of a damaged mailbox shall be made only upon the presentation of satisfactory evidence of sales receipts for materials used in such repair and replacement. All labor or cost of labor to install or re-install said mailboxes shall be the responsibility of the owner of the mailbox. 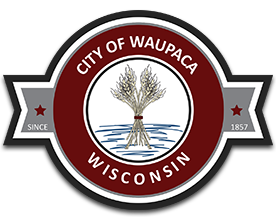 If you should have any questions, please contact the Public Works Department Streets Division at 715-258-4421. Your cooperation on this matter is greatly appreciated.